The Monastic-Martyress Eugenia, by birth a Roman, lived at Alexandria, where her father, Philip, was sent by the emperor Commodus (180-192) in the capacity of governor of Egypt. Eugenia received a fine upbringing and was noted for her good disposition and beauty. Many an illustrious youth sought her hand, but she did not wish to enter into marriage. And having become acquainted with the Epistles of the Apostle Paul, she yearned with all her soul to become a Christian and so in secret from her parents, in the company of her two servants Protus and Hyacinthus, attired in men's garb, she set out to a men's monastery. There together with her servants and companions she accepted holy Baptism from bishop Elias, who learned about her in a vision, and he gave blessing for her to pursue asceticism at the monastery as the monk Eugene. By her ascetic feats Saint Eugenia acquired the gift of healing. One time a rich young woman named Melania turned to her for help. Seeing what before her seemed a young monk, this woman burned with an impure passion, and upon being spurned, she contrived a slander about a forcible attempt. Saint Eugenia came to trial before the governor of Egypt, i.e. her father, and she was forced to reveal her secret. Her parents were exuberant, finding before them one over whom they had long grieved. After a certain while they all accepted holy Baptism. But Philip, upon the denunciation of pagans, was displaced from the post of governor. The Alexandrian Christians chose him as their bishop. The new governor, fearing the wrath of the people, did not dare openly to execute Philip, but instead dispatched assassins. During the time of solitary prayer of Saint Philip, they inflicted wounds upon him, from which he died three days later as a martyr. Having thus become widowed, Saint Claudia and her daughter and servants set out to her estates, situated near Rome. There Eugenia continued with monastic life. She brought many young women to Christ, and Claudia built a wanderers hostel and aided the widowed. After the course of several peaceful years, the emperor Galienus (260-268) began anew the persecution against Christians, and many of them found refuge with Saints Claudia and Eugenia. During these times a young Roman girl, named Vacilla, orphaned and of imperial lineage, heard about the Christians and Saint Eugenia, and wanting to meet the saint she wrote her a letter. In answer, Saint Eugenia sent her friends and co-ascetics, Protus and Hyacinthus, who enlightened Vacilla, and she accepted holy Baptism. The servant of Vacilla then told her fiancee Pompei, that his fiancee had become a Christian, and Pompei made complaint to the emperor against the Christians for preaching celibacy. Summoned to answer, Vacilla refused to enter into marriage with Pompei, and for this they killed her with a sword. They dragged Saints Protus and Hyacinthus into an idolous temple for making them sacrifice, but just as they entered therein, the idol fell down and was shattered. The holy Martyrs Protus and Hyacinthus were beheaded. They likewise by force brought Saint Eugenia to the temple of Diana, but she did not even enter it, when all the pagan temple with its idol collapsed. They threw the holy martyress into the Tiber with a stone about her neck, but the stone plunged downwards and she remained unharmed. She remained unharmed also in fire. Then they cast her into a pit, where she remained for 10 days. During this time the Saviour Himself appeared to her and announced, that she would enter into the Heavenly Kingdom on the day of the Nativity of Christ. When this radiant feastday was come in the year 262, the executioner killed the holy martyress with a sword. 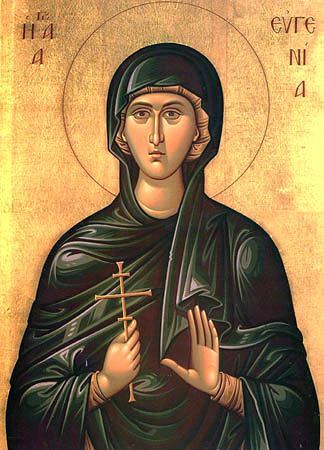 Saint Claudia soon also received a martyr's crown. Saint Eugenia had told her beforehand about her day of death.